Soul Stories explores two worlds: the world we know with our feelings and senses — sight, scent, touch, belonging, joy, loss, renewal — and the parallel world of dreams, intuition, imagination, and the dimension of the unknown. Together these realms inform, shape, challenge, and nurture the soul. 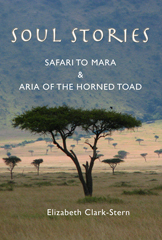 Safari to Mara finds our heroine on the brink of womanhood in Masai society. The only daughter in a sonless family, she is drafted to do work in the modern world, yet tradition calls her to prepare for initiation as a wife. In the wilderness of her namesake, Kenya’s Masai Mara, she finds an improbable guide who leads her into the mysterious recesses of her awakening heart. Aria of the Horned Toad begins with the dream of a horned toad crawling out of Beatrice’s eyes, “so real I could feel his prickly little feet on my nose.” And so begins an odyssey to the source of all dreaming. Beatrice believes that in this dark and luminous place, she can find someone to fashion a dream to fix her Mama’s terrible ways, and soothe the longing in her own wild spirit. Elizabeth Clark-Stern is a psychotherapist in private practice in Seattle,Washington. Before embracing this beloved work, she worked as a professional screenwriter. Her produced plays and teleplays include All I Could See From Where I Stood, Help Wanted, and To See The Elephant. Her play, Out of the Shadows: A Story of Toni Wolff and Emma Jung (Genoa House 2010) was performed at the International Jungian Congress in South Africa in 2007.